In this earlier post, I mentioned my enjoyment over finding five seconds of behind-the-scenes footage on Actor-Director-Producer-Mentor Horace James. In tribute to his influence with the original Men of Gray movie and its sequel Flight of the Ibis, here is more information and a few links for those who knew him or appreciated his work. In the sequel to Men of Gray, Horace was involved once again, but as an actor this time. Here’s a shot from Ibis, in which he portrayed a high-ranking government official, making deals with the country’s top drug lord Russo, played by Paul Tuerpe. This was, I think, his last dramatic role. But it was hardly his first. You can get the full picture of his film acting credits (as well as his other roles as Writer, Producer, and Director) from his filmography on IMDB. It unfortunately doesn’t list his stage credits. 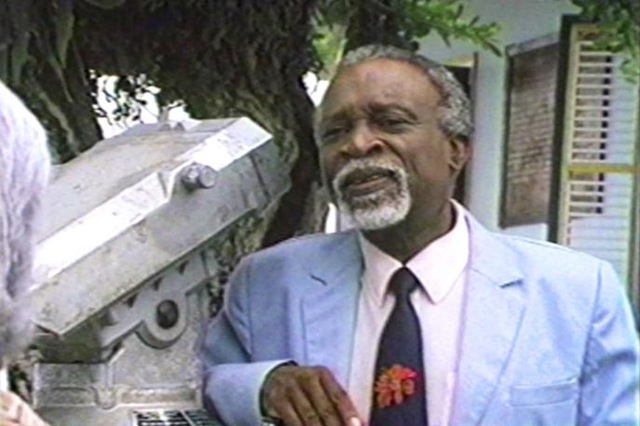 Horace James was honored by the National Drama Association (NDATT) in 1988 with the Cacique Lifetime Achievement Award for his contribution to drama. To read more on his life story, here’s an enjoyable biographical article about Horace when he was 69 and one week shy of a heart surgery (not his first). He indeed died at the age of 70. For details on that, here’s a moving and informative obituary published upon his death in June, 2000. Not many of us can say this, but there’s even a song dedicated to him by Paul Keens-Douglas. You can hear a snippet at this link, or download the whole song. But not all of Horace James’ drama happened on stage or on camera; a Wikipedia article mentions Horace as one of the hostages in the July, 2000 Jamaat al Muslimeen coup attempt against the government of Trinidad and Tobago. Side note: I just barely missed the risk of also being a victim in that coup attempt, as the terrorists took over the TTT television station where I was stationed day and night until about 10 days before before the attack, editing Men of Gray. I remember Horace as a Trinidadian Benjamin Franklin of sorts. He was charming, usually smiling, always influencing, and yet rarely in the fore. If anyone else has remembrances of Horace James they’d like to share, please do so. This entry was posted on Tuesday, September 15th, 2009 at 5:05 pm and is filed under Men of Gray I, Men of Gray II, Trinidad & Tobago. You can follow any responses to this entry through the RSS 2.0 feed. You can leave a response, or trackback from your own site. Horace James was my uncle. I am Winnifred C James and my Dad was Dennis R James hence the relationship, my dad revered his brother, my search for information on my uncle was due to the passing of my dad who was cremated today.